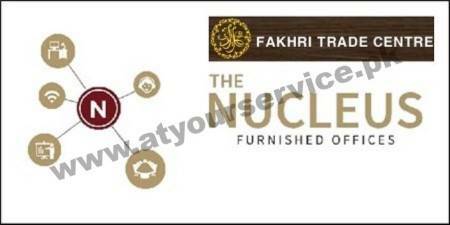 Fakhri Trade Centre (FTC) is situated at a prime location of the business and commercial importance. We offer a solution for all businesses with fully managed offices at affordable prices. Whatever your business whatever your budget we’ll help find the right workspace. Enterprising and dynamic businesses need variable spaces for them to grow. The concept of ‘one-size-for-all’ cannot be applied. Nucleus caters to this demand and provides a tailored solution for the most economical, efficient and professional way for working. All our offices are fully equipped, ready to use as private offices with different seating capacity for small and medium enterprises. The offices are specifically tailored Co-Working spaces with all the amenities of the modern workplace. These are ideal for ideal for startups and entrepreneurs. Modern ergonomic furniture providing a comfortable workspace. Professional business outlook giving your office a class. Centralized HVAC Heating, Ventilation and Air Conditioning maintaining thermal comfort as per ASHRAE Standards. Uninterrupted electrical power supply 24/7. All utilities and maintenance cost billed at the end of the month. High-speed internet service provided by Transworld. Local Area Network, WiFi, plug and play connections. Local Telephone with an option of international calling. All facilities continually maintained and upgraded at intervals keeping up with the modern advancements. Printers connected on the network. Sharp color printouts and photocopies. Scan and Fax service also provided. Multiple conference rooms with Skype and the latest video conferencing tools. Conference room Space for 8 people to 20 people. Small meeting room for interviews and meetings. Several comfortable lounge space for casual business chatter. Every office is locked and access is granted with RFID cards. Building parameter secured by surveillance and armed guards. Ample parking space in the building. Cars are given access via RFID control System. Visitor parking entertained per request. Guests entertained and shown the way by our reception team. Mail received by our reception team. Access to administrative support, to help with tasks like document collection or arranging couriers. Security, cleaning and general maintenance. At Nucleus, you get flexible terms for your agreement. You can upsize or downsize your office space as per your needs. To get more details, please call us or send an online inquiry. Visiting this place will definitely be a treat for you.